"Tangy pasta salad which is better made the day before!" In a large pot of salted boiling water cook pasta until al dente. Drain and cool under cold water. 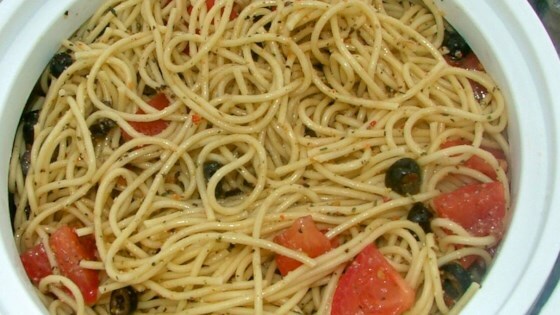 Combine cooked pasta with Italian dressing, Italian salad seasoning, green onions, cucumber, tomatoes and black olives. Toss to coat and refrigerate overnight before serving. The best of both worlds combine in this dish! Pasta with broccoli, cauliflower, cherry tomatoes, cucumber, and olives. Mix it all up with Italian dressing for a delightfully flavorful meal. Sprinkle with Parmesan cheese to top it off. use this spaghetti salad recipe but also can add pepperoni cut into quarters as well. Also many people use Salad Supreme (found by spices) instead of Italian Dressing mix. My Family Enjoyed this recipie, it was quick and easy and tasted great! Especially when it has had time to marinade. This would be a great recipie to make the day before! I make a similar salad to this, but I like using angel hair pasta, rather than spaghetti, and break in thirds before cooking. Also try adding a package of pepperoni cut into quarters.....YUMMY! Makes so much more than you would think! Tasted great!